Cape Town experienced growth in visitor numbers in the first two months of 2010, ahead of this summer's Fifa World Cup, according to the latest stats form the United Nations World Trade Tourism Organisation (UNWTO). UNWTO's World Tourism Barometer reported that international arrivals into Cape Town had grown by 7% in the first two months of 2010. This comes off the back of an upturn of 2% in the last quarter of 2009 after 14 consecutive months of negative results. 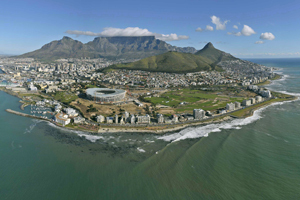 UNWTO also forecast that international tourism arrivals into Cape Town would grow by 3-4% in 2010. Cape Town Tourism CEO Mariette du Toit-Helmbold said that the fact that Cape Town is playing a significant part in South Africa hosting the 2010 Fifa World Cup should boost figures further. "Although the tourism industry will remain under significant pressure for sime time to come, the figures from UNWTO are very heartening indeed," she said. "We can expect gradual improvement towards 2011, and couple this to the fact that the World Cup is just around the corner, and South Africa will be showcased to an international audience, there is plenty of room for optimism." Read Dragonfly sales and marketing manager Robin Mcleod's blog on Cape Town as part of his insiders countdown to the South Africa World Cup.